Apple Compare Trade in prices to Sell My Apple Watch Series 3 42mm Space Black Stainless Steel GPS Cellul in Brand New Condition for 💰 Cash. Best Value for My Apple Watch Series 3 42mm Space Black Stainless Steel GPS Cellul for Online Recycling. Get Paid within 24 hours! Compare prices for your Brand New or Unwanted Apple Watch Series 3 42mm Space Black Stainless Steel GPS Cellul. Cash out today by getting the best quote online for your Brand New Apple Watch Series 3 42mm Space Black Stainless Steel GPS Cellul that you no longer need and would like to sell. Find out how much your brand new Apple Watch Series 3 42mm Space Black Stainless Steel GPS Cellul is worth and select your prefered buyer. Today, the most cash you can get for your Apple Watch Series 3 42mm Space Black Stainless Steel GPS Cellul is £140.00 paid by Music Magpie. That is the highest value for this mobile today online. I want to sell my new unwanted Apple Watch Series 3 42mm Space Black Stainless Steel GPS Cellul. How much can I sell it for? Music Magpie and 0 other recyclers will buy your brand new Apple Watch Series 3 42mm Space Black Stainless Steel GPS Cellul. You can also check if they buy faulty/damaged Apple Watch Series 3 42mm Space Black Stainless Steel GPS Cellul. Can I sell my damaged Apple Watch Series 3 42mm Space Black Stainless Steel GPS Cellul for cash? How many Brand New Apple Watch Series 3 42mm Space Black Stainless Steel GPS Cellul can I sell to Online Phone Recyclers? What do I send when I sell my Apple Watch Series 3 42mm Space Black Stainless Steel GPS Cellul for cash? What stores buy Brand New Apple Watch Series 3 42mm Space Black Stainless Steel GPS Cellul for cash? Recyclers, like offers online trade-ins for Apple Watch Series 3 42mm Space Black Stainless Steel GPS Cellul. 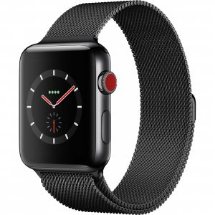 You can get up to £140.00 online if you recycle your Apple Watch Series 3 42mm Space Black Stainless Steel GPS Cellul today with Music Magpie as they seems to pay the top price which indicates they have a huge demand of these second hand, used or even faulty Apple Watch Series 3 42mm Space Black Stainless Steel GPS Cellul.